David Allan Wins ANZPT Queenstown Snowfest! Tags: 2012 anzpt queenstown snowfest, david allan, Ken Demlakian, pokerstars.net. Posted on Monday, July 30, 2012 by "T". Yesterday, Aussie David Allan became the 2012 PokerStars.net ANZPT Queenstown Snowfest main event champion after a very thrilling heads-up match versus Ken Demlakian! Allan had a bit less chips than Demlakian when the battle started but took a decent lead almost straight away and managed to maintain it for quite some time, but the lead then chopped and changed several times until Demlakian seemed to be in full control. In fact, Allan only had 20 big blinds left and no one expected him to come back. But Allan refused to give up as he switched gears and and played his very best game. His confidence grew and grew as he took down more and more pots. After a two-hour heads-up battle, the final hand occurred. David Allan limped the button and Ken Demlakian checked the big blind. Both players checked the 8 3 7 flop. The Q fell on the turn and Demlakian bet $50,000. Allan called. The river card was the K and Demlakian led for 60,000. Allan raised to 170,000 and Demlakian announced that he was all-in. It didn't take long before Allan made the call and turned over 10 6 for a flush. Demlakian showed 7 3 for two-pair and it was all over. 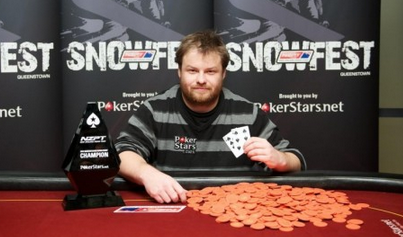 4 comments for "David Allan Wins ANZPT Queenstown Snowfest!" Demlakian wanted to make Alan believe he had higher flush, and it was a risky call for Alan, believing he didn’t have it. And, after all, he didn’t had a single spade and Alan took the first prize. Demlakian’s future oponentes should write this on a book to read the next time they play against him, although i don’t know if it will be soon that he will risk again all of chips in a bluff. Nasty way to lose it, but he'll know it was a bad beat not lack of skill that lost it. Is that the major tourney in NZ?